For those of us who have ventured into old chess magazines that use the now obsolete English Descriptive notation , nothing quite strikes fear into our hearts like the use of QB vs KB, or even more horrifying, the use of QN vs KN or the equally terrifying QR vs KR. This notation is far more confusing, and annoying than the old-fashioned use of Kt (as in knight). Even Kieseritzky’s odd notation from his La Regence magazine, while taking some effort to master, is unambiguous, unlike the Q-side vs. K-side notation. So, while not all English Descriptive notation uses this poor convention, those that do can be very, very confusing. I found several errant games due to the difficulty of reading this notation in the age of computer screens – when you can’t even use a piece of tape to distinguish a K-side piece from a Q-side one. I’ve been thinking about this problem for awhile, and thought that it should be easy to have a computer program display the Q-side and K-side pieces differently. But I’ve been hacking, and digging down, into SCID code base in the past few days – and it would be quite a chore to implement this very simple idea. Fundamentally, the code was designed from the get-go to treat all the K-side and Q-side pieces the same. Still – as an exercise in getting even the simplest of graphics out there – I decided to try to implement the idea. It’s not playable – but at least I got far enough to display the initial setup of the board – voila! You can see that I’ve added little dots to distinguish the Q-side from the K-side (the dots reflect the color of the bishop’s home square). I also flipped the knights around – so they no longer face in the same direction. Now, all I’ve really done is figure out how to download the latest version of PIL (or pillow) to use with Python’s Tkinter. Still, it seems not much more effort is required to move the pieces around while tracking the LAN (Long Algebraic Notation). The thing is that LAN basically just records a piece being moved from here to there – and does require any real understanding of chess – unlike PGN, which require a lot of sophistication (recognizing pins, etc.). I can just trust the historian to make legal moves, seeing as I’ve helped him track a QN vs. a KN (or QR vs KR – the bishops are easy as they always stay on color). It’s a specialty item, and doesn’t really need to be robust. 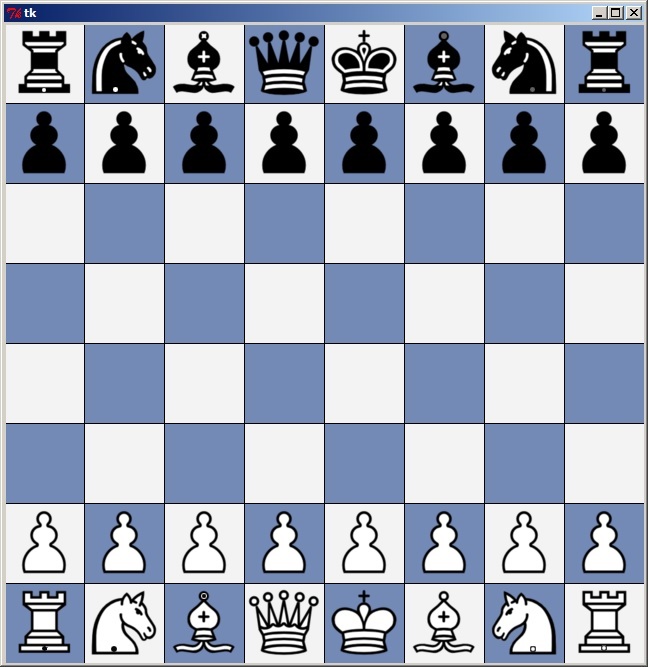 Still, someday I won’t mind just picking a chess piece style from a SCID dropdown menu and seeing the setup show above – I wouldn’t need it a lot, but it should would be appreciated when I did.